An overview of Step Lights & Wall Lights - LED, Xenon and other options, 12 volt and line voltage. Compare products, options and prices. Step Lights & Wall Lights can be used indoors or outdoors. An overview of Mini Step Lights, Mini Wall Lights & Deck Lights - LED, Xenon and other options, 12 volt and line voltage. Compare products, options and prices. These smaller lights can be used indoors or outdoors. 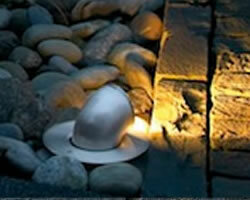 An overview of Brick Lights & Paver Lights - LED, Xenon and other options, 12 volt and line voltage. Compare products, options and prices. Brick lights can be used indoors or outdoors. With a sleek profile and no visible hardware, LEDme® Step and Wall Lights are designed to seamlessly blend into any architecture. These lights offer enhanced energy efficient functionality and optimized light output to adequately illuminate stairs, walls and walkways with little or no glare. Cast aluminum body is sealed for both indoor and outdoor applications. 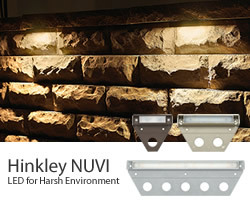 Hinkley Lighting NUVI offers exceptional 12v LED horizontal illumination due to its innovative composite optic technology. Constructed of durable, solid vinyl alloy NUVI is fit for harsh environments, offering resiliency and long-life. A diverse range of mounting opportunities and easy installation ensure maximum flexibility. ETL rated for indoor/outdoor use. 10-Pack is perfect for project work. Unique Hardscape LED light fixtures are available in multiple Kelvin Temperature options; warm white 2700K, pure white 3000K and cool white 4200K. They are available in 1, 3, 6, and 9 LED fixtures. Tested to withstand the elements for years of enjoyment. Easy to install. Easily adapts to almost any hardscape, deck, step or bench application. Kichler damp LED tape is engineered to perform in areas with moisture exposure. Perfect for an outdoor covered area such as a porch, gazebo or roofed patio. Smart connections and features make Kichler LED Tape uniquely easy to install. Light Kichler color-changing RGB LED Tape creates a full-range of highly saturated colors that can be programmed to many different modes and controlled via radio frequency remote. Customize a business or home with static color or color-changing RGB LED tape and add flair in nearly any space. Available for Dry, Damp or Wet Location. InvisiLED Pro provides bright lighting for indoor or outdoor use. InvisiLED Palette Outdoor allow you to change the ambiance and color scheme of your exterior space at the touch of a button. Versatile enough to suit residential needs for home accent illumination with holiday flair as well as large commercial venues for various event functions that require a DMX link to professional control systems. InvisiLED Tape Light is available in Classic, High Performance and Color Changing. The original tape light system, WAC InvisiLED Classic 12V is available in cool or warm white, perfect for unique accent and display lighting applications. A customizable system that brings life and color to a wide range of hard to light spaces. InvisiLED Classic 24 series offers 4 rich colors and white light at over 100 lumens per foot. 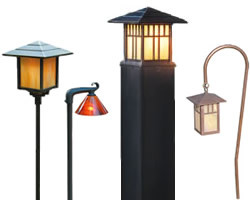 Outdoor lighting from Besa, Fine Art Lamps, Kalco, Kichler and more. Every style, finish and price point to set off your home. Landscape lighting, bullets, flood lights, inground lights, wall washers, deck lights, down lights, hanging lights, tree lights, underwater lights and more. Start here to choose the functional and attractive path lighting for your home.